To drink baking soda can boost your body's overall health by maintaining proper pH levels. It can treat specific health problems like kidney stones, gout, etc. Baking soda - also called bicarbonate of soda or sodium bicarbonate―dissolved in water, has long been used to relieve the signs and symptoms of arthritis, indigestion, heartburn, and infection, among other maladies. Baking soda, consumed in moderate portions and at appropriate times, helps bring about healthy body biochemistry. Baking soda isn't only for baking; consuming baking soda water periodically throughout the day can boost your health. Baking soda water works as an antacid and antiseptic, which helps ease stomach and digestive troubles. Additionally, it can boost your body's alkalinity and potentially combat some diseases. Sodium bicarbonate is most commonly known as an antacid, meaning it neutralizes acid, particularly in the stomach. Acid reflux disease, often called heartburn, has numerous causes. Stomach acid splashes out of the stomach into the esophagus and can sometimes get as far up as the back of the throat. Drinking water with baking soda mixed into it helps neutralize the stomach's hydrochloric acid, eliminating the problem of heartburn. At the same time, the effervescence that happens when bicarbonate of sodium is combined with water encourages burping, which helps relieve bloating and gas. Baking soda's mild antiseptic properties kill some kinds of parasites, fungi, and mold. Because of this, applying baking soda to your toothbrush disinfects the brush and cleans your teeth. Gargling with baking soda water can also help minimize the symptoms of a sore throat or persistent cough. Another benefit of baking soda is its ability to promote a more alkaline PH balance in the body. Alkalinity is the reverse of acidity. Acidity is necessary for effective digestion of food, but an overall alkaline PH in your body is considered healthier, because many diseases thrive in an acidic environment. Diseases of a degenerative nature, like osteoporosis, arthritis, and cancer, have been associated with a chronically high acidity level in the body. The low cost of baking soda combined with its potential health benefits make a regimen of baking soda water drinking a worthwhile dietary change. In addition to the above benefits, simple household baking soda is incredibly versatile in helping to prevent kidney stones, gout, and urinary tract infections. Baking soda has also been linked with improved performance in serious athletes. This is a kind of joint inflammation that happens when uric acid builds up in the urine, blood, and tissues. 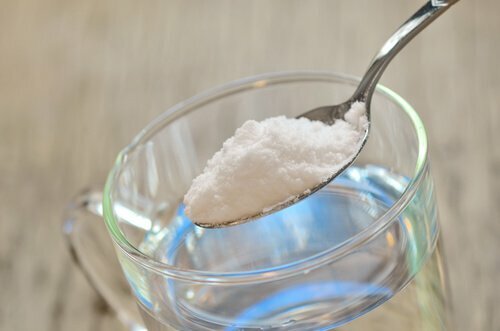 Because drinking baking soda water can balance the body's pH level, some health experts recommend bicarbonate of soda to combat uric acid formation. Sodium bicarbonate may also help individuals with urinary tract infections. Drinking baking soda blended in water can help the body overcome the infection by reducing the acid in urine. To experience even greater relief, drink lots of water and cranberry juice as well. Strenuous exercise leads to the buildup of lactic acid with associated muscle pain and fatigue. The longer an athlete can delay lactic acid buildup, the better his performance, especially in sports that require endurance and speed. Consuming baking soda water accomplishes this for elite athletes. Baking soda can help in many cases. And for different cases, you may have to follow a varied dosage to get desired results. To find out your body's PH, buy some inexpensive litmus PH paper at your local pharmacy and measure your urine and saliva. First thing in the morning, your saliva PH measurement should ideally be between 7.0 and 7.4 before you drink anything. Expect your urine to be slightly more acidic in the morning, since your body has been clearing acids from your body all night. A urine PH reading between 6.0 and 7.0 is appropriate in the morning, and it should increase slightly during the day. Take these readings for a few days, tracking your results. If your PH levels are consistently lower than this, you can use a baking soda regimen to bring you to healthy levels. If your average is low or in the acidic range, drink a glass of water with a half-teaspoon of baking soda dissolved in it twice per day. You need to have acids in your stomach to digest food, so take baking soda only between meals. Continue to monitor your PH. If it's still low, drink this mixture up to four times a day as needed to improve your PH. Once your pH has normalized, eat more vegetables and less acidic food and you should be able to maintain the benefits. Baking soda has been demonstrated to reduce the duration of cold and flu, frequently eliminating symptoms in 36 hours. Experts recommend the following dosage schedule. Day 1 - Take six doses of baking soda in glass of water at about two-hour intervals. Day 2 - Take four doses of baking soda in a glass of water at the same intervals. Day 3 - Take two doses of baking soda in a glass of water in the morning and in the evening, and after that only once each morning until cold symptoms are gone. Science is proving what athletes have known for years: Bicarbonate of soda can enhance sports performance. Baking soda appears to work best to enhance endurance and speed. Baking soda appears to reduce the acidity produced in the muscles during sports such as running or swimming. Sodium bicarbonate helps the body process lactic acid, which is responsible for the burning sensation produced in the muscles during hard exercise. Only elite athletes are likely to notice the benefits, however, since it only seconds, not minutes, off racing speeds. Baking soda is high in sodium. It's not safe in high doses and shouldn't be used for long periods of time. Individuals who have edema, liver disease, kidney disease, or high blood pressure shouldn't use baking soda. Possible side effects of consuming baking soda in water include cramping of the stomach and increased thirstiness. NEVER take baking powder; it is an entirely different substance than baking soda or sodium bicarbonate. Ingredients in baking powder can harm your body. Avoid drinking anything with bicarbonate of soda if you're on a sodium-restricted diet or if you have high blood pressure, unless directed by your doctor. If you're on prescription drugs, get medical clearance before taking baking soda. Do not give baking soda with water to children younger than age five. If you have a full stomach, do not drink baking soda water until you've had a chance to digest. Athletes should find out from their trainers and doctors if baking soda is considered a banned performance enhancer in their sport. To avoid impurities like aluminum that some brands of baking soda may contain, you can buy pure sodium bicarbonate, which is widely available online. Be cautious with baking soda and consult your doctor if you are on a sodium-restricted diet or have high blood pressure, because it's moderately high in sodium.